There has been other important news at the University of Alberta today — though there hasn’t been a peep or a Tweet about it from the University administration. In the latest world university rankings from QS, officially out today, two units at the University of Alberta have made it into the top 50 of universities worldwide in their fields. One of them is the Faculty of Pharmacy. The other is a department housed in the Faculty of Arts. In 2009-2010, the department in question was told, along with all other departments in the Faculty of Arts, that it had to cut its already very limited departmental operating budget by 50%. The department in question had no choice but to pull its phones from the wall. The Faculty has been subject to extremely damaging cuts since, with the cuts last year leading to the loss of many support staff and the closing of faculty positions. Our bark has been “tempest-tost,” and the news today, though on the face of it good, shows us the dilemma: How can we, in the face of the Government’s devastating cuts to postsecondary education in its budget of March 7th, do anything other than dwindle, peak, and pine, and recede from the very accomplishments that make possible today’s news? In the weekend’s Journal, Kathleen Lowrey (Anthropology) asked Albertans to understand the game of “let’s pretend” that the Government is playing with Albertans, as those who survive in various facets of the public sector struggle to continue doing, on Fumes, the work they were already doing on Not Enough, because they care about the people affected by their work. Let’s play a related game, the game of Let’s Imagine. Imagine where this department might rank if it had not been subject to cuts but had been instead the beneficiary, along with other departments in Arts, of investment. Imagine what its faculty members would be achieving, along with other faculty members in Arts, if the Government valued the Arts in such a way as to nurture us. What work might we be doing for the public good that we cannot now do because we lack, in so many forms, the necessary support? We lack support staff, lost in the reorganization last year. We lack research time, for which the Faculty stopped offering internal support a few years ago. We lack the time to bring the innovations in our research to bear as fully as we want to upon our teaching as time pressures produced by other lacks converge. This logic applies, of course, across the entire institution. Where might all units at the University of Alberta be with the appropriate investment? Just a couple of years ago, the University claimed that it wanted to be amongst the “Top 20” in the world by 2020. As I have noted repeatedly, if you look closely at the rankings of the universities that are actually in the Top 20 more often than not their Faculties of Arts outrank the institutions as a whole. And so today’s news is distinctly bittersweet. It confirms that the Faculty of Arts has the potential to help the University as a whole achieve the ambition that the Government’s cuts compel the University to abandon. For at the very moment in which Canada should be investing in its postsecondary institutions, as Provost Carl Amrhein says in this morning’s University Affairs, what is the Government of Alberta doing? It’s pulling the lifecord that sustains us out of the wall. Let’s be clear: the direction of funds away from individual institutions to an institute for commercializing research is a direction of funds away from those units within Alberta’s postsecondary institutions that do non-commercializable research. Pharmacy will do well under the Government’s new scheme, for as the Minister of Enterprise and Advanced Education has made clear the Government’s plans for that institute centrally involve US Big Pharma. The Government’s choice will have its greatest negative implications for the other Faculty that today scored so well in the QS world university rankings. And the implications of this redirection of funds are already been felt, with great pain, at other Faculties of Arts across the province. 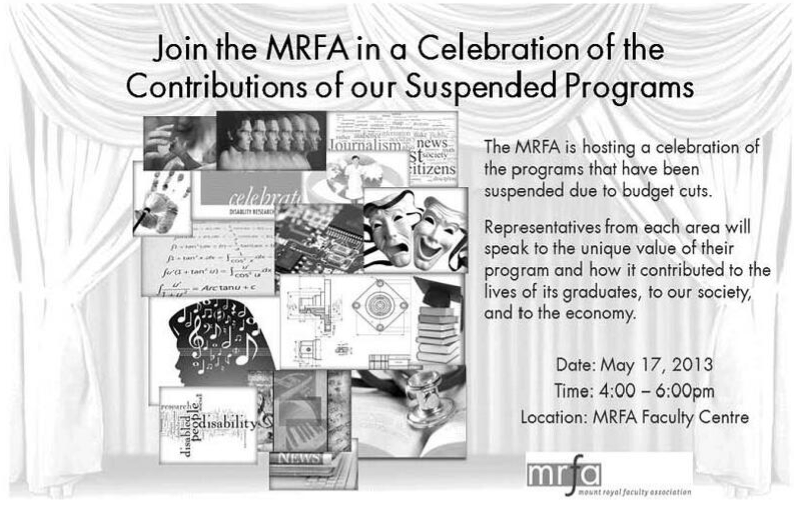 Mount Royal University will be holding a wake for its many closing programs on May 17th. Most of those programs are in Arts. Today’s news may be about one department in only one of the province’s Faculties of Arts, but it should give us all some sense of what this Government, with its devastation of public goods in its budget of March 7th, is doing to the province as a whole: undermining our promise, and taking away what might have been. How do universities compete internationally? By being given the funds necessary to do their work to the best of their ability. If only the Government would stop playing its game of “Let’s Pretend,” and play that other, far superior game of “Let’s Imagine.” Let’s imagine what Alberta’s postsecondary institutions might be — and might have been — with the appropriate Government investment. You can hold a wake for what is being killed off. But how do you mourn what does not exist and never will because a Government hasn’t had or does not have the foresight, courage, and imagination to bring it into being? This entry was posted in Uncategorized and tagged carl amrhein, kathleen lowrey, mount royal university, mount royal university faculty association, qs world university rankings, university of alberta. Bookmark the permalink. U of A’s EFS (at 37) came in ahead of MIT’s (at 40)… but run that new funding strategy by me again? 😉 Great post. Congratulations to EFS. Rankings are in general a troubling thing, but isn’t it paradoxical that we are exhorted to do well in them, and then when we do, it suddenly doesn’t seem to matter? Useful exposé! If we had phones, just think of what EFS (and other departments) could do! Depressingly, it’s not just Alberta and it’s not just Arts: basic science in all of Canada is also in trouble.